The team at Nexus Websites have a long history of living within the Oxfordshire and Abingdon areas and as such we aim to offer an excellent and personal service to all of our clients within the area. 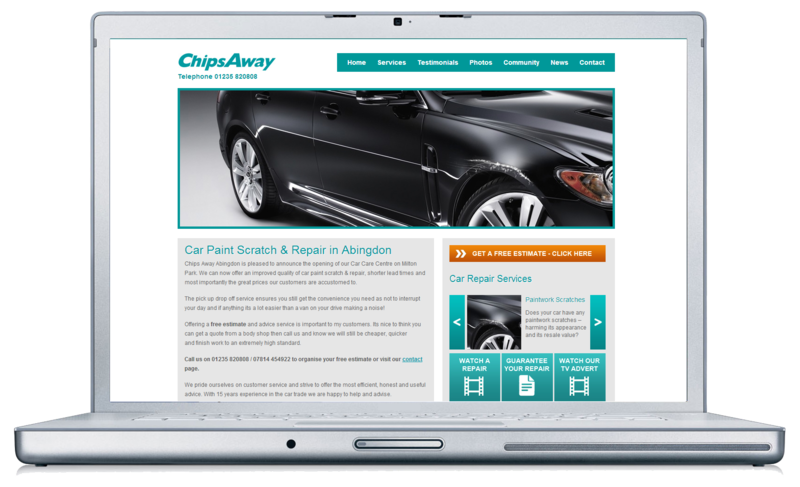 Chips Away Abingdon is a leading UK company that specialises in car bumper scuff repairs and paint scratch repairs. We were tasked with designing a new look for the Chips Away Abingdon while keeping to the theme and branding of their old website, as well as integrating modern features into the website such as social media, video links and a new, easy to use content management system. We also provided highly successful SEO services for Chips Away, as they are now ranked top when searching “paint scratch” in Google. Aqualine Plumbing is a small company based in Didcot, near Abingdon that offers a wide range of plumbing services to the local area. Our task was to create modern and stylish web design to help with Aqualine Plumbing’s online presence for the Didcot and Abindgdon areas. We believe we have achieved this by creating a design that is simple and easy to use. If you are in need of any Abingdon web design services, please get in touch with our web design Abingdon team today and we’ll be happy to find a solution for you!